Tilapia is one of my favourite Fish ! I'm always used to eating it deep fried in Oil & Coated with a thin layer of Flour (after marinading it for sometime) , This is how we usually cook Tilapia in Egypt ! And since I'm a very busy mom & I always have no time, So I decided to fry it in Butter with some Salt & Pepper ,without wasting a long time in the marinade . I used a good non-stick pan , as Tilapia is a very fragile fish & choose a nice relatively thick Tilapia cut to use & it was really so delicious, I felt the real fish taste in my mouth , The recipe I used before was perfect, but I liked this way of cooking more as the taste of Fish was not masked by other the flour & frying process . This is an easy delicious way to do Lamb Kotletts or chops, it's done in nearly 10 minutes after maination for few hours! we usually eat Lamb meat in Egypt more in our feast which is coming up soon, & we usually eat it with "Fattah" (recipe here: http://drolacooks.blogspot.de/2012/10/egyptian-fattah-rice-meat-bread-dish.html ). or you can simply serve it with Rice or French fries! Oven backed Potatoes is one of my favourite side dishes, It's easy & fast & tastes always perfect! I guess there are no chances for failure! Me & my family eat at least twice a week a vegetarian meal for lunch. This week's choice was veggie Burger. I loved the recipe & what's good about it is that you can use any type of Vegetables available in your house & thus having a different taste every time you do it. Marinade the chicken in Olive oil & spices and leave for 3-4 hours. Enter preheated oven for 15 minutes then turn the chicken breasts on the other side for another 15 minutes. During the baking process , pour the juices coming out of the Chicken over it (every 10 minutes). N.B: you might need to add some water if your Chicken dries. In a sunny afternoon, I thought of doing a light-fresh cool dessert, I had some remaining vanilla cupcakes, cream chesse, ready made whiped cream & a jar of Clementine, so I came up with this yummmmy dessert! Yogurt-Raspberries cups with Raspberry Sauce. Yogurt cups with Raspberry Sauce. Very light summery dessert, easy,fast & delicious. This a very nice recipie that is ideal for kids too. Put Köfte in a pan that can be covered & bring a piece of coal & heat it then put an onion cortex with some butter in the middle over the meat (you make a groove inside the meat with your fingers & lay the onion cortex inside it) then put the heated piece of coal inside the butter ,you will find smoke coming out of the heated piece of coal , then close firmly the pan for 30 minutes. 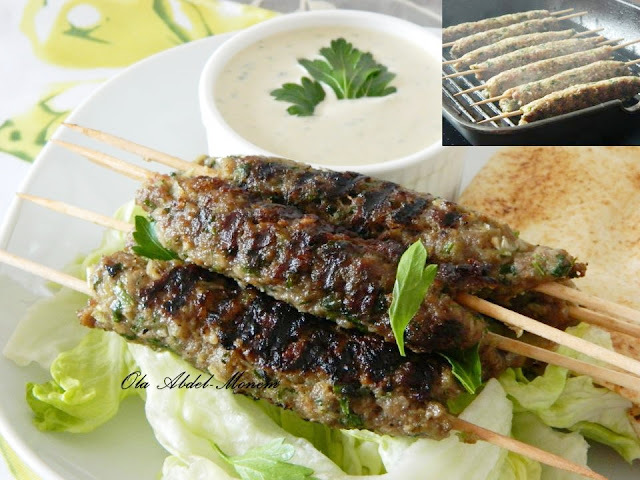 Then form Kofte in skewers & grill. This is a very easy dish everyone loves! 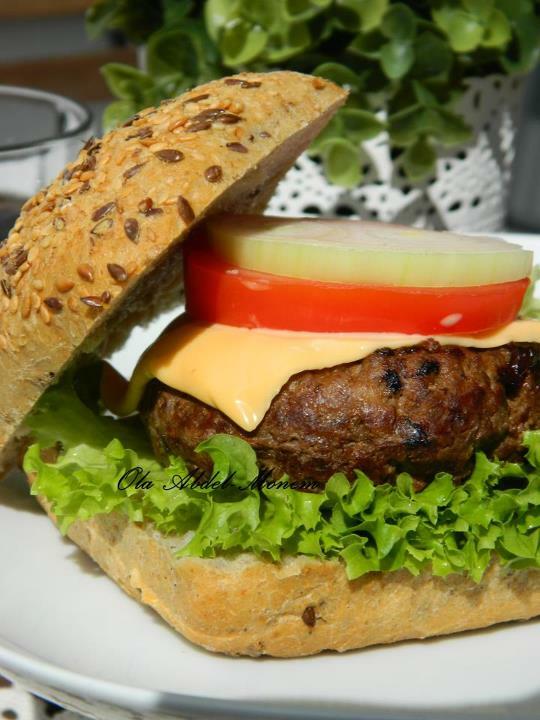 Simply use a glass jar lid (I used the Nutella jar lid) to press the meat against it,then flip it over to get the patties out. An easy delicious & nutritive recipie that kids also like a lot. It can be served as a side dish with Potatos or Rice. In a pan heat olive oil & add onion & garlic & stirr , add Spinach & keep stirring (5 minutes) then drain from water & add salt & pepper. in a bowl, mix, eggs, sourcream, cheese, whippingcream, salt & pepper. Prepare your Ramekins by buttering . Add drained spinache evenly in the 4 Ramekins. Then pour the eggs-cream mixture over the spinache. sprinkle some sliced almonds on top. Enter pre-heated oven (220°C) for 10 -15 minutes till golden on top. Grilled Hot dog skewers with oven backed Potatos. This is an easy & delicious recipie that kids love & doesn´t take time at all. You will need sliced Hot dogs, Pepper,Onions. marinade your cut pepper & onions with some oil, salt & pepper. Arrange your skewers with hot dogs, pepper & onions.